Do you need a dental crown or dental bridge? What are they, and why might you need one? It is possible that you have been told by a dentist at some point in the past that you need a dental crown or a dental bridge. What is a dental crown? What is a dental bridge? And why might you need one? 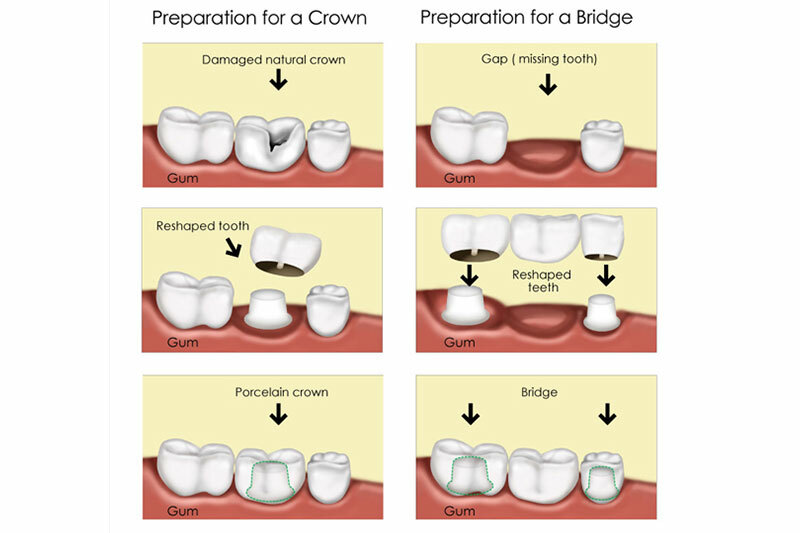 A dental crown is done to repair a tooth that has been damaged (either from a cavity, by breaking the tooth, etc.) and cannot be repaired with a dental filling because the damage to the tooth is larger than the filling can repair. A dental bridge is done to replace a tooth that is missing or needs to be extracted. The procedure is similar to what is done when fixing a single tooth with a dental crown. In some instances, a dental implant is a better long-term option for replacing the tooth than a dental bridge. A good dental crown or dental bridge done by a quality dentist can protect a dental patient’s natural teeth and help that patient keep their teeth healthy and happy for life.